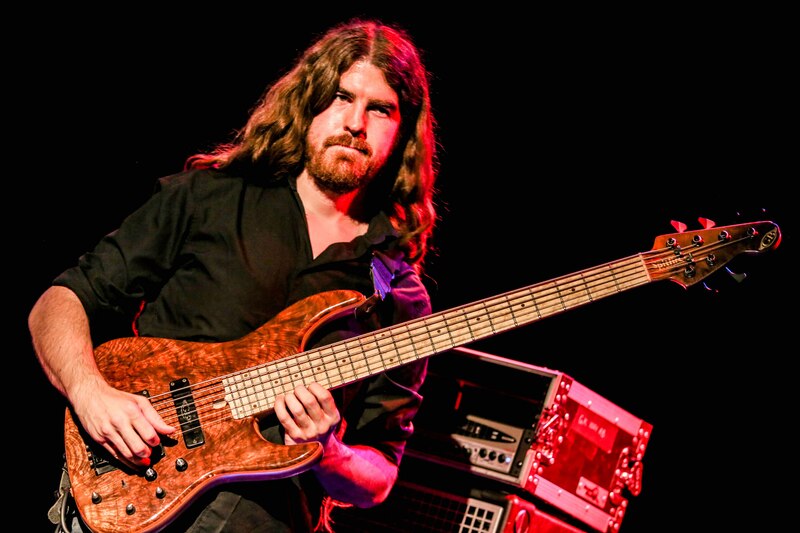 Limelight Magazine recently caught up with bassist extraordinaire Simon Fitzpatrick of Carl Palmer’s ELP Legacy. The band just completed an extensive world tour, including a show at the Narrows Center for the Arts in Fall River, Mass., on May 5, 2013. Fitzpatrick, a graduate of the Institute of Contemporary Music Performance, also released a solo CD called Reflections to coincide with the tour. On August 3rd, he’ll be performing again with Carl Palmer’s ELP Legacy at the Susquehanna Bank Center in Camden, NJ, as part of YES’s first ever festival called YESTIVAL – a day-into-night musical adventure in full quadraphonic sound. Please enjoy our interview. Limelight Magazine (LM): You just finished an extensive world tour with Carl Palmer’s ELP Legacy. How did the tour go overall? Simon Fitzpatrick (SF): I thought the tour was a great success overall. It’s the longest tour the band has done to date, starting in Japan in February and ending in May in New York, and it was a real pleasure to perform all around the world. LM: Were there any shows that stood out from the rest? Why? SF: For me the two gigs we played on Cruise to the Edge were a real standout. It was an honour to perform in front of the greats of progressive rock like Yes, Steve Hackett and UK and also to have the chance to watch them perform. Sailing through the Caribbean for five days and making tropical island excursions to swim with dolphins was a plus too. LM: This must have been asked many times but how did you get your current job as Carl Palmer’s bass player? SF: Dave Marks, one of my former bass guitar tutors, is a previous member of the band. When former bassist Stuart Clayton left, Carl asked Dave for recommendations for a replacement and my name came out. Carl checked out some of my YouTube videos and the rest is history. LM: According to your website, you also work with two London based acts: The Robbie Boyd Band and Elephant Gun. Do you still work with them? Do you find it hard to bounce back and forth between all three bands? It is difficult because there are inevitably going to be clashes. Fortunately, the other bands I work with are very flexible and able to use replacements when I’m not available. Being involved with different projects also gives me the chance to enjoy playing differing styles of music (in this case folk/pop and jazz/fusion) rather than being tied down to one genre. LM: You graduated from the Institute of Contemporary Music as best overall bass player from both the diploma and the degree courses. When did you start playing the bass? What motivated you to play this instrument? SF: After discovering metal as teenagers, my twin brother and I were inspired to learn the guitar, especially after watching bands like Megadeth, Fear Factory and Slipknot. We soon realised that to have a band, one of us was going to have to learn the bass and I was the one to really take to it and I haven’t looked back since. Sadly, I don’t think many people are drawn to the bass first but I think of it as my mission to change that! LM: Who were your musical inspirations growing up? Who do you listen to now for inspiration? SF: The music which I was first passionate about was the nu-metal wave from the early 2000’s. From there my tastes expanded to all forms of metal including the progressive form which took me to Dream Theater who were probably my biggest inspiration. I’d never heard anything like them before and it was a real eye opener about musical creativity, what could be achieved on a musical instrument and how far technical ability could be pushed. Very soon after I’d bought a six string bass and was absorbing as much as I could about what you could do with it. That feeling of being blown away after hearing some new music is harder to find these days but I listen to all kinds of music and try to be open to inspiration from anything. In terms of bass players my biggest influences have probably been Victor Wooten, Stu Hamm, Jaco Pastorius and John Myung. LM: You brought out the stick bass at the Howard Theatre in Washington D.C. Do you play the stick bass often? Did you use it on any other dates on the tour? LM: You released a solo album called Reflections that coincided with the tour, containing many of your previous solo spots, some songs you haven’t performed live and some original pieces. How long did it take you to record the album? Why did you select the cover songs you did? SF: Much of the album was recorded in the last couple of months before the tour started, although the content reflects my solo bass playing from the last couple of years. For my solo spots I try to select an epic piece (like “Bohemian Rhapsody” or “Stairway to Heaven”), which has enough content for me to be able to keep it interesting as an instrumental and which is well known enough for the majority of our audiences to be able to connect with it. Other pieces on the album are favourites of mine which I wanted to put my own spin on and some well known classical pieces which I felt could be brought out well on the bass. LM: You received a standing ovation at the Narrows Center for the Arts for your cover of Yes’ “Roudabout.” How do you feel getting that type of response? It really means a lot to me to get a reaction like that as it shows that all the hard work was worth it. One of my favourite things about playing in the US is how the crowds will really let you know how they feel – usually in a good way! British crowds are great too but they can be a little reserved and standing ovations are much less common. LM: Are you possibly looking to follow up Reflections with another album? SF: I’m constantly working on new solo arrangements, so when I feel I have enough material I’ll most likely put it together as a second album. LM: Do you want to continue playing music as a career for the rest of your life or do you have other goals? SF: Yes at the moment that is my intention but who knows what the future holds. SF: It’s always a pleasure to visit the New England area so I look forward to returning to play some more music. Thanks!